Here's a look at how umpires and teams have fared through 100 Replay Reviews into the 2018 regular season (104 through April 11's games). Gabe Morales is the league's most successful umpire, Jeff Kellogg the most overturned, Detroit the most successful team, and a three-way tie for least successful. The most common reasons for review are 1) Force plays at first base, 2) Tag attempts on stolen bases, and 3) Tags into a base off a base hit. Follow along throughout the season on our Umpire Replay Review Statistics and Sabermetrics page. 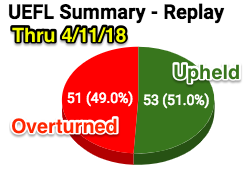 Replay Pie Summary - 51% Upheld. Replay Review Decisions: 104 (games ending 4/11/18). Leaderboard - Top 10 Umpires (Through 4/11/18). 1. Gabe Morales - 1.000 (3 for 3). 2. Danley, Fairchild, Ben May - 1.000 (2 for 2). 5. [15 Tied] - 1.000 (1 for 1). 20. [7 Tied] - .667 (2 for 3 or 4 for 6). 43. [11 Tied] - .000 (0 for 1). 54. Cuzzi, Hernandez, Marquez - .000 (0 for 2). 57. Barksdale, DiMuro - .000 (0 for 3). 59. Kellogg - .000 (0 for 4). 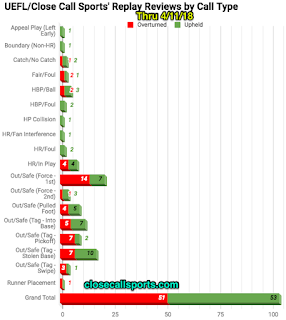 Replay Reviews by Type (click image for full view). Leaderboard - Teams (Through 4/11/18). 1. Out/Safe (Force - 1st) - 22 reviews (.318 RAP). 2. Out/Safe (Tag - Stolen Base) - 17 reviews (.588 RAP). 3. Out/Safe (Tag - Into Base) - 12 reviews (.583 RAP). 4. Out/Safe (Pulled Foot) - 9 reviews (.556 RAP). 5. Out/Safe (Tag - Pickoff) - 9 reviews (.222 RAP).